An in-depth report on the causes, diagnosis, treatment, and prevention of foot pain. The foot is a complex structure of 26 bones and 33 joints, layered with an intertwining web of muscles, ligaments, and nerves. Pain can occur anywhere along the foot, including in the toes, front of the foot, heel, or bottom of foot. For certain conditions, physical therapy can be helpful. In severe cases, surgery may be needed. Do not ignore foot pain. It is not normal. It is critical that people with diabetes see a medical doctor at least once a year for a checkup. Alternate shoes. Do not wear the same pair of shoes every day. Avoid walking barefoot, which increases the risk for injury and infection. Do not avoid all exercise if you have foot pain. Treat your foot pain right away, and switch to low impact exercises (swimming, cycling) to stay fit, especially if you are trying to lose weight. Staying active reduces your risk of other diseases. Foot pain generally starts in 1 of 4 places: the toes, the forefoot, the midfoot, or the hindfoot. Flat feet are associated with tarsal tunnel syndrome and posterior tibial tendon dysfunction (PTTD). High arches may be associated with nerve and bone disorders, and conditions such as claw toe. Medical Conditions. Any medical condition that affects joints, skin, tendons, ligaments, nerves, or blood vessels can contribute to foot problems. Osteoarthritis, and other arthritis disorders that affect the joints, is the most common medical condition associated with feet and ankle pain. Diabetes is the most common nerve and circulatory related disorder associated with feet problems. Injury. High-impact exercising, such as jogging or strenuous aerobics, can injure the feet and ankles. Common foot injuries include corns, calluses, blisters, muscle cramps, damage to toenails, plantar fasciitis, Achilles tendinitis, and metatarsalgia (pain at the ball of the foot). Footwear. Poorly fitting shoes are a frequent cause of foot pain. High-heeled shoes concentrate pressure on the toes and can aggravate, if not cause, problems with the toes. Osteoarthritis (OA). OA is a degenerative joint disease that causes progressive loss of cartilage, the smooth material that cushions the ends of bones. It is the most common form of arthritis. In feet, OA primarily affects the big toe, midfoot, and ankle. It typically affects one foot. Rheumatoid arthritis (RA). RA is an autoimmune disease in which the body's immune system attacks joints and other tissues. RA can affect the small joints in the feet and ankle. Unlike OA, RA usually affects similar joints in both feet. Gout. A type of arthritis caused by a build-up of uric acid in the blood. Gout usually affects the joint in the big toe, but it can also attack joints in the ankle or elsewhere. Diabetes reduces or distorts nerve function, causing a condition called neuropathy. Neuropathy causes numbness and loss of sensation. People with neuropathy often do not notice injuries to their feet. Minor cuts, abrasions, or blisters can become infected and develop into ulcers (open sores). Neuropathy can also lead to dry and cracked skin that makes them more vulnerable with infection. Diabetes also causes poor blood circulation, which can increase the risks for infection and slow the healing process. A non-healing infection may result in gangrene. Gangrene and a foot ulcer that do not respond to treatment can result in an amputation of the gangrenous tissue. People with diabetes should inspect their feet every day. They should have their health care provider show them how to properly trim nails. Corns and calluses can be treated by a foot doctor. A special concern for people with diabetes. Charcot foot or Charcot joint (medically referred to as neuropathic arthropathy) is a degenerative condition that affects the bones and joints in the feet. It is associated with the nerve damage that occurs with neuropathy. A person with Charcot foot cannot feel the injuries and the joint will deteriorate quickly even without the person noticing it until significant damage has occurred. Early changes appear similar to an infection, with the foot becoming swollen, red, and warm and can be caused by twisting the foot or ankle while walking or stepping off a stair. Gradually, the affected foot can become deformed. The bones may crack, splinter, and erode, and the joints may shift, change shape, and become unstable. A risk factor is anything that increases your chances of getting a disease or condition. The following are factors that increase your risk for foot pain. Older people are at high risk for foot problems. As you age, your feet widen and flatten, and the fat padding on the sole of the foot wears down. The skin on the feet also becomes dryer. Foot pain in older adults may be the first sign of age-related conditions, such as arthritis and circulatory disease. Foot problems can also impair balance and gait and interfere with daily functioning. Women are at higher risk than men for severe foot pain, likely because of high-heeled shoes and weaker ligaments. Gaining weight puts added stress on the feet and can lead to foot or ankle injuries. The added pressure on the soft tissues and joints of the foot in overweight people increases the likelihood of developing tendinitis and plantar fasciitis. Pregnant women have an increased risk of foot problems due to weight gain, swelling in their feet and ankles, and the release of certain hormones that cause ligaments to relax. These hormones help when bearing the child, but they can weaken the feet. People who engage in regular high-impact aerobic exercise are at risk for plantar fasciitis, heel spurs, sesamoiditis, Achilles tendinitis, and stress fractures. Women are at higher risk for stress fractures than men. People who spend long amounts of time on their feet at work often experience foot problems. Taking fashion to extreme limits, some people turn to cosmetic surgery as a drastic way to fit into high-heeled shoes. Procedures include surgical shortening of the toes, narrowing of feet, or injecting silicone into the pads of the feet. Such methods may increase your risk for future foot pain. The American Orthopaedic Foot and Ankle Society (AOFAS) and other foot-related medical associations have expressed concern over this trend. The AOFAS strongly advises against cosmetic foot surgery and urges consumers to carefully consider the relative risks and benefits of undergoing unnecessary surgical procedures. A corn is a protective layer of dead skin cells that forms due to repeated friction. It is cone-shaped and has a knobby core that points inward. This core can put pressure on a nerve and cause sharp pain. Corns can develop on the top of, or between, toes. If a corn develops between the toes, it may be kept pliable by the moisture from perspiration and is therefore called a soft corn. Calluses are composed of the same material as corns. Calluses, however, develop on the ball or heel of the foot. The skin on the sole of the foot is ordinarily about 40 times thicker than the skin anywhere else on the body, but a callus can even be twice as thick. A protective callus layer naturally develops to guard against excessive pressure and chafing as people get older and the padding of fat on the bottom of the foot thins out. If calluses get too big or too hard, they may pull and tear the underlying skin. Do not wear shoes that are too tight or too loose. Wear well-padded shoes with open toes or a wide toe box (the part of the shoe that surrounds the toes). If necessary, have a cobbler stretch the shoes in the area where the corn or callus is located. Wear thick socks to absorb pressure, but do not wear tight socks or stockings. Apply petroleum jelly or lanolin hand cream to corns or calluses to soften them. Use doughnut-shaped pads that fit over a corn and decrease pressure and friction. They are available at most drug stores. Place cotton, lamb's wool, or mole skin between the toes to cushion any corns in these areas. To remove a corn or callus, soak it in very warm water for 5 minutes or more to soften the hardened tissue, and then gently sand it with a pumice stone. Several treatments may be necessary. Do not trim corns or calluses with a razor blade or other sharp tool unless done by a medical professional. Unsterile cutting tools can cause infection, and it is easy to slip and cut too deep, causing excessive bleeding or injury to the toe or foot. A bunion is a deformity that usually occurs at the end of the first metatarsal bone (the long bone that attaches to the big toe). A bunion may also develop in the bone that joins the little toe to the foot (the fifth metatarsal bone), in which case it is known as either a bunionette or a tailor's bunion. The big toe or the fifth ("pinky") toe is forced in toward the other toes, causing the head of the metatarsal bone to jut out and rub against the side of the shoe. The underlying tissue becomes inflamed, and a painful bump forms. As this bony prominence develops, a bunion is formed as the big toe is forced to grow at an increasing angle toward the rest of the toes. One important bunion deformity, hallux valgus, causes the bone and joint of the big toe to shift and grow inward, so that the second toe crosses over it. The second toe may grow over or under the big toe as they cross over. This can cause corns to develop. People born with abnormal bones in their feet are more likely to form a bunion. In addition, wearing narrow-toed, high-heeled shoes, which put enormous pressure on the front of the foot, may also lead to a bunion formation. The condition may become painful as extra bone and a fluid-filled sac grow at the base of the big toe. Flat feet, gout, arthritis, and occupations (such as ballet) that place undue stress on the feet can also increase the risk for bunions. A thick doughnut-shaped, moleskin pad can protect the protrusion. In some cases, an orthotic can help redistribute weight and take pressure off the bunion. Nonsteroidal anti-inflammatory drugs (NSAIDs) or rarely corticosteroid injections may offer some pain relief. If discomfort persists, surgery may be necessary, particularly for more serious conditions, such as hallux valgus. There are different surgical approaches, ranging from removing the bump to realigning the toes. Rarely, a limited procedure known as a simple bunionectomy can be performed. This involves shaving down the bone of the big toe joint. This procedure rarely cures all of the symptoms of a bunion. Arthrodesis (removal of damaged portion of the joint, followed by implantation of screws, wires, or plates to hold the bones together until they heal). Tendon and ligament repair. If tendons and ligaments have become too loose, the surgeon may tighten them. In severe cases, surgeons may use bone grafts to restore bone length in people who have had previous bunion surgeries or damage from osteoarthritis. Recovery from more invasive procedures, such as arthrodesis or osteotomy, may take 4 to 6 months, and it can be up to 6 to 8 weeks before a person can put full weight on the foot. In such cases, the person will need to wear a cast or use a special shoe orand may need to use crutches or a wheelchair. A hammertoe is a permanent deformity of the toe joint, in which the toe bends up slightly and then curls downward, resting on its tip. When forced into this position long enough, the tendons of the toe shrink, and the toe stiffens into a hammer- or claw-like shape. At first, a hammertoe is usually flexible, and any pain it causes can usually be relieved by putting a toe pad, sold in drug stores, into the shoe. To help prevent and ease existing discomfort from hammertoes, shoes should have a deep, wide toe area. As the tendon becomes tighter and the toe stiffens, other treatments, including exercises, splints, and custom-made shoe inserts (orthotics) may help redistribute weight and ease the position of the toe. People with severe cases of hammertoe may need surgery. If the toe is still flexible, only a simple procedure that releases the tendon may be needed. If the toe has become rigid, more extensive surgery involving the bone may be required. 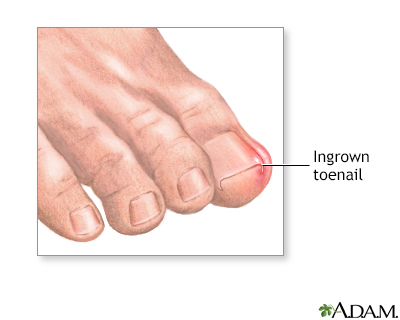 An ingrown toenail is a condition in which the edge of the toenail grows into the skin of the toe. The big toe is most commonly affected. Symptoms include pain, redness, and swelling around the toenail. Trim toenails straight across and keep them long enough so that the nail corner is not visible. If the nail is cut too short, it may grow inward. If the nail does grow inward, do not cut the nail corner at an angle. This only trains the nail to continue growing inward. When filing the nails, file straight across the nail in a single movement, lifting the file before the next stroke. Do not saw back and forth. A cuticle stick can be used to clean under the nail. To relieve pain from ingrown toenails, try wearing sandals or open-toed shoes. Soaking the toe for 5 minutes twice a day in a warm water solution of salt, Domeboro or Betadine can help. People who are at increased risk for infections, such as those with diabetes, should have professional treatment. Antibiotic ointments may help treat ingrown toenails that are infected. Apply the ointment by working a wisp of cotton under the nail, especially the corners, to lift the nail up and drain the infection. The cotton will also help force the toenail to grow out correctly. Change the cotton daily, and use the antibiotic consistently. In severe cases, more intensive treatments are needed. Surgery involves simply cutting away the sharp portion of ingrown nail, removing the nail bed, or removing a wedge of the affected tissue. Orthonyxia is a technique that implants a small metal brace into the top of the nail. Some of the nail bed or tissue may be removed without making incisions. Nonsurgical methods include using cauterization (heating), or lasers, to remove the skin. Recurrence is typically higher after simple, more temporary procedures to relieve pain. A review of 24 studies (nearly 3,000 patients) evaluating treatments for ingrown nails found that surgical procedures are more effective than non-surgical therapies in preventing recurrences. Forefoot pain refers to pain and discomfort felt toward the top of the foot. The rate of forefoot pain and deformity increases with age. When a cause cannot be determined, any pain on the ball of the foot is generally referred to as metatarsalgia. A neuroma usually means a benign tumor of a nerve. However, Morton's neuroma, also called interdigital neuroma, is not actually a tumor. It is a thickening of the tissue surrounding the nerves leading to the toes. Pain from Morton neuroma can be reduced by massaging the affected area. Roomier shoes (box-toed shoes), pads of various sorts, and cortisone injections in the painful area are also helpful. If these treatments are not effective, surgery may be an option. Surgical techniques involve removing a portion of the nerve or tissue surrounding the nerve. Occasionally, the nerve tissue may re-grow and form another neuroma. Sesamoiditis is an inflammation of the tendons around the small, round bones that are embedded in the head of the first metatarsal bone, which leads to the big toe. Sesamoid bones bear much stress under ordinary circumstances, but excessive stress can strain the surrounding tendons. Often there is no clear-cut cause, but sesamoid injuries are common among people who participate in jarring, high-impact activities, such as ballet, jogging, and aerobic exercise. Rest and reducing stress on the ball of the foot are the first lines of treatment for sesamoiditis. A low-heeled shoe with a stiff sole and soft padding inside is all that is usually required. Special orthotics can sometimes be helpful. In severe cases, surgery may be necessary. A stress fracture in the foot, also called fatigue or march fracture, usually results from a break or rupture in any of the five metatarsal bones (mostly the second or third). These fractures are caused by overuse during strenuous exercise, particularly jogging and high-impact aerobics. Women are at higher risk for stress fracture than men. A fracture in the first metatarsal bone, which leads to the big toe, is uncommon because of the thickness of this bone. If it occurs, however, it is more serious than a fracture in any of the other metatarsal bones because it dramatically changes the pattern of normal walking and weight bearing. You should seek treatment if pain persists for 3 weeks. Treatment after that time may reduce the chances of returning to previous level of functioning. Surgery may be needed if conservative measures fail. Conservative treatment usually includes protected weight bearing with crutches or boots. In most cases, stress fractures heal by themselves if you avoid rigorous activities. Some health care providers recommend moderate exercise, particularly swimming and walking. It is best to wear low-heeled shoes with stiff soles. Occasionally, a provider may recommend wearing a walking "boot" (brace) to reduce pain and facilitate healing. Shoe inserts, medications, and Achilles stretching are generally first line of therapy for heel pain. If these treatments fail, heel cups or orthotics and extended physical therapy are recommended. Surgery may be an option if other methods have failed. Achilles tendinitis, also called Achilles tendinosis, is an inflammation of the tendon that connects the calf muscles to the heel bone. It is caused by small tears in the tendon from overuse or injury. This condition is most common in people who engage in high-impact exercise, particularly jogging, racquetball, and tennis. People who have a shortened Achilles tendon are at high risk for this disorder. Such people tend to roll their feet too far inward when walking, and may bounce when they walk. A shortened tendon can be due to an inborn structural abnormality, or it can develop from regularly wearing high heels. Tight calf muscles can also increase the risk for Achilles tendinitis. Symptoms include pain in the heel and along the tendon when walking or running. The area may feel painful and stiff in the morning. The tendon may be painful to touch or move. The area may be swollen and warm. You may have trouble standing up on the toes f one foot. The main treatments for Achilles tendinitis do not involve surgery. It is important to remember that it may take at least 2 to 3 months for the pain to go away. Decreasing activity (including walking) that causes you pain. You can switch to other activities (biking, swimming) that put less stress on the Achilles. Applying ice to the tendon. Using nonsteroidal anti-inflammatory drugs (NSAIDs) such as ibuprofen (Advil, generic). Your provider may refer you to physical therapy. A physical therapist can prescribe exercises to help stretch and strengthen your calf muscles and Achilles tendon. The therapist may also apply modalities such as ultrasound to help break down any scar tissue. The exercises used for Achilles tendinitis treatment are called eccentric training. They involve standing on the balls of your feet at the edge of a low stool or block, raising the heels and then gently allowing one heel at a time to reach toward the floor. It is important to wear shoes that give you good support. Shoes that are slightly raised in the back are helpful for people with Achilles tendinitis. Your provider may also give you a prescription for a custom-made orthotic to fit inside your shoe. If these treatments do not improve symptoms, you may need surgery to remove inflamed tissue and abnormal areas of the tendon. Surgery also can be used to remove the bone spur that is irritating the tendon. Extracorporeal shock wave therapy (ESWT) may be an alternative to surgery for people who have not responded to other treatments. This treatment uses low-dose sound waves. Achilles tendinitis may make you more likely to have an Achilles rupture. This condition usually causes a sharp pain, like someone hit you in the back of the heel with a stick. Surgical repair may be necessary, but it is difficult because the tendon is not normal. Bursitis of the heel is an inflammation of the bursa, a small sack of fluid beneath the heel bone. Nonsteroidal anti-inflammatory drugs (NSAIDs), such as aspirin or ibuprofen (Advil), and rarely steroid injections can help relieve pain from bursitis. Applying ice and massaging the heel are also beneficial. A heel cup or soft padding in the heel of the shoe reduces direct impact when walking. Pronation is the normal motion that allows the foot to adapt to uneven walking surfaces and to absorb shock. Excessive pronation occurs when the foot has a tendency to turn inward and stretch and pull the fascia. It can cause not only heel pain but also hip, knee, and lower back problems. Applying ice followed by moist heat will help ease discomfort. Nonsteroidal anti-inflammatory drugs (NSAIDs), such as aspirin or ibuprofen (Advil), will also reduce pain. Your provider may recommend an orthotic device to control heel motion. In severe cases, surgery may be necessary to remove or reduce the bony growth. Studies suggest, however, that recovery from surgery is very long, and success rates vary. It is best to try conservative measures before considering surgery. The plantar fascia is the thick tissue on the bottom of the foot. It connects the heel bone to the toes and creates the arch of the foot. When this tissue becomes swollen or inflamed, it is called plantar fasciitis. Plantar fasciitis is one of the most common orthopedic foot complaints. Most people with plantar fasciitis experience pain in the heel with their first steps in the morning. The pain also often spreads to the arch of the foot. The condition can be temporary, or it may become chronic if ignored. Resting can provide relief, but only temporarily. If these methods do not work, your provider may recommend other treatments such as corticosteroid injections into the heel, a boot cast, or custom-made orthotics. Sometimes, foot surgery may be needed. Injection of platelet rich plasma is a newer technique for chronic plantar fasciitis and may be as effective as steroid injections. Put the hands on a wall and lean against them. Place the uninjured foot on the floor in front of the injured foot. Raise the heel of the injured foot. Gently stretch the injured leg and foot. With stretching treatments, the plantar fascia nearly always heals by itself but it may take as long as a year, with pain occurring intermittently. You need to be careful not to overdo activity or reinjure yourself while your foot is healing. In rare situations, you may need surgery to address the problem. "Flat foot," or pes planus, is a defect of the foot that eliminates the arch. Flat feet occur because the tissues holding the joints in the foot together (called tendons) are loose. Babies are born with flat feet but the tissues tighten and form an arch as children grow older. Most people have normal arches by the time they are adults. However, the arch may never develop in some people. Flat feet can also develop in adulthood. In most cases, flat feet do not cause pain but certain conditions associated with flat feet may be painful. Age. PTTD is more common in people, especially women, over age 40. Sports. High-impact sports such as running can increase risk. Health conditions. Obesity, diabetes, and high blood pressure are conditions that can lead to PTTD. People with flat feet are at increased risk for tarsal tunnel syndrome. This condition results from compression of the posterior tibial nerve that runs through a narrow passage behind the inner ankle bone down to the heel. It can cause tingling, numbness, and pain along the inside of the ankle or bottom of the foot. Treatment for pain associated with flat feet conditions generally involves rest, ice, pain relief medications, and insoles or custom-made orthotics to support the foot and prevent progression. In severe cases, corticosteroid injections may be needed to reduce inflammation. Physical therapy may be recommended. An overly-high arch ("hollow foot") can also cause problems. High arch is an arch that is raised more than normal. The arch runs from the toes to the heel on the bottom of the foot. It is also called pes cavus. High foot arches are less common than flat feet. They are more likely to be caused by a bone (orthopedic) or nerve (neurological) condition. Unlike flat feet, highly arched feet tend to be painful because more stress is placed on the section of the foot between the ankle and toes (metatarsals). This condition can make it difficult to fit into shoes. People who have high arches usually need some type of foot support with corrective shoes or inserts. They should also be checked for nerve and bone conditions. Clawfoot, or pes cavus, is a deformity of the foot marked by very high arches and very long toes. The toes are pointed down and the arch is high, making the foot appear claw-like. Clawfoot is a hereditary condition, but it can also occur when muscles in the foot contract or become unbalanced due to nerve or muscle disorders. If you suspect that you have broken or fractured bones in a toe or foot, call your health care provider, who will probably order x-rays. Even if you can walk, you still might have a fracture. People are often able to walk even if a foot bone has been fractured, particularly if it is a chipped bone or a toe fracture. The acronym RICE stands for rest, ice, compression, and elevation -- the four basic elements of immediate treatment for an injured foot. Rest. Get off injured foot as soon as possible. Ice. Icing is particularly important to reduce swelling and promote recovery during the first 48 hours. Wrap a bag or towel containing ice around the injured area on a repetitive cycle of 20 minutes on, 40 minutes off. Compression. Lightly wrap an elastic bandage (ACE bandage) around the area. Elevation. Keep the foot raised on several pillows. Minor injuries like sprains may be treated at home if broken bones are not suspected. 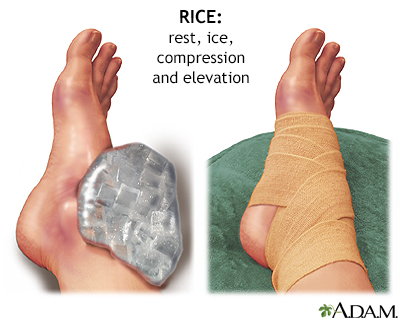 The acronym RICE is helpful for remembering how to treat minor injuries: "R" stands for rest, "I" is for ice, "C" is for compression, and "E" is for elevation. Pain and swelling should decrease within 48 hours, and gentle movement may be beneficial, but don't put pressure on a sprained joint until the pain is completely gone (one to several weeks). Do not ignore foot pain. It is not normal. If the pain persists, see a medical doctor or podiatrist. Inspect feet regularly. Pay attention to changes in color and temperature. Look for thick or discolored nails (a sign of developing fungus), and check for cracks or cuts in the skin. Peeling or scaling on the soles of feet could indicate athlete's foot. Any growth on the foot is not considered normal. Wash feet regularly, especially between the toes, and dry them completely. Avoid walking barefoot, which increases the risk for injury and infection. At the beach or when wearing sandals, always use sunblock on your feet, as you would on the rest of your body. It is critical that people with diabetes see a podiatrist at least once a year for a checkup. People with diabetes, poor circulation, or heart problems should not treat their own feet, including toenails, because they are more prone to infection. Make sure shoes fit properly. Purchase new shoes later in the day when feet tend to be at their largest, and replace worn out shoes as soon as possible. Select and wear the right shoe for specific activities (such as running shoes for running). Skin creams can help maintain skin softness and pliability. A pumice stone or loofah sponge can help get rid of dead skin. Taking a warm footbath for 10 minutes two or three times a week will keep the feet relaxed and may help prevent mild foot pain caused by fatigue. Adding 1/2 cup of Epsom salts may increase circulation and add other benefits. Taking footbaths only when the feet are painful is not as helpful. The first year of life is important for foot development. Parents should cover their babies' feet loosely, allowing plenty of opportunity for kicking and exercise. Change the child's position frequently. Children generally start to walk at 10 to 18 months. They should not be forced to start walking early. Wearing just socks or going barefoot indoors helps the foot develop normally and strongly and allows the toes to grasp. Going barefoot outside, however, increases the risk for injury and other conditions, such as plantar warts. Children should wear shoes that are light and flexible, and since their feet tend to perspire, their shoes should be made of materials that breathe. Replace footwear every few months as the child's feet grow. Footwear should never be handed down. Protect children's feet if they participate in high-impact sports. In general, the best shoes are well cushioned and have a leather upper, firm heel counter, and flexible area at the ball of the foot. The heel area should be strong and supportive, but not too stiff, and the front of the shoe should be flexible. New shoes should feel comfortable right away, without a breaking-in period. If shoes do need breaking in, place moleskin pads next to areas on the skin where friction is likely to occur. Once a blister occurs, moleskin is not effective. Change shoes during the day, and rotate between different pairs of shoes. As soon as the heels show noticeable wear, replace the shoes or their heels. Well-fitted shoes are the best way to prevent many problems with the feet. The sole should be shock absorbent and the upper should be constructed of breathable material. Shoes with laces are good since they can be easily adjusted to accommodate width. Shoes should be purchased in the afternoon or after a long walk, when the feet have swelled. There should be 1/2 inch of space between the longest toe and the tip of the shoe (remember, the longest toe is not always the big toe), and the toes should be able to wiggle upward. It is important that the front of the shoe provide adequate space for the toes. Stand when being measured, and have both feet sized, buying shoes that fit whichever foot is largest. Wear the same socks as you would regularly wear with the new shoes. Women who are accustomed to wearing pointed-toe shoes may prefer the feel of tight-fitting shoes, but with wear their tastes may adjust to shoes that are less confining and properly fitted. Shoes purchased for exercise should be specifically designed for a person's preferred sport. For instance, a running shoe should especially cushion the forefoot, while tennis shoes should emphasize ankle support. Athletic socks are almost as important as shoes. Experts often recommend padded acrylic socks. Sufficient cushioning to absorb shock and pressure, which should be many times greater than shock from walking. Arches that maintain side-to-side stability. Thick upper leather support. Box toe. Orthotics may be required for people with ankles that over-turn inward or outward. Soles should allow for twisting and turning. Rigid support across the arch to prevent collapse during pedaling. Heel lift. Cross-training or combo hiking/cycling shoes may be sufficient for the casual biker. Toe clips or specially designed shoe cleats for serious cyclers. In some cases, orthotics may be needed to control arch and heel and balance the forefoot. Sufficient cushioning to absorb shock and pressure. Fully bendable at the ball of the foot. Enough traction on the sole to prevent slipping. Consider insole or orthotic with arch support for problem feet. Allows side-to-side sliding. Low-traction sole. Snug fitting heel with cushioning. Padded toe box with adequate depth. Soft-support arch. Lightweight. Breathable upper material (leather or mesh). Wide enough to accommodate ball of the foot. Firm padded heel counter that does not bite into heel or touch anklebone. Low heel close to ground for stability. Good arch support. Front provides support and flexibility. Insoles are flat cushioned inserts that are placed inside the shoe. They are designed to reduce shock, provide support for heels and arches, and absorb moisture and odor. In general, they can be helpful for some people. People respond very differently to specific insoles. What may work for one person may not work for another. Consider the thickness of socks when purchasing insoles to be sure they do not squeeze the toes up against the shoes. Insoles can be purchased in athletic and drug stores. Shoe stores that specialize in foot problems often sell customized, but more expensive, insoles. Most well-known brands of athletic shoes have built-in insoles. There are many types of insoles available. They are composed of various materials, such as cork, leather, plastic foam, and rubber. Many insoles are now made from viscoelastic polymers, which are gel-like materials that act both as liquids and solids. People who have developed short, tightened Achilles tendons should consider using heel cushions. Like insoles, heel cushions are inserted inside the shoes. For certain conditions, your provider may give you a prescription for a custom-made orthotic. Custom orthotics (also called orthoses) are individually designed to fit your specific foot and foot problem. The orthotic provider will evaluate your gait and stance and do a custom casting of your feet. These molds are then used to create your personal orthotics. Custom orthotics are much more expensive than store-bought shoe inserts. They are not usually covered by insurance. However, if you have severe foot problems they can be more effective. They also last longer (usually for several years). Rigid Orthotics. A rigid orthotic is used to control motion in two major foot joints that lie directly below the ankle. They are often used to prevent excessive pronation (the turning in of the foot). Soft Orthotics. A soft orthotic is designed to absorb shock, improve balance, and remove pressure from painful areas. They are made from a lightweight material and are often beneficial for people with diabetes or arthritis. Semi-Rigid Orthotics. A semi-rigid orthotic is designed to provide balance, often for a specific sport. It is typically made of layers of softer materials reinforced by hard material. Akimau PI, Cawthron KL, Dakin WM, Chadwick C, Blundell CM, Davies MB. Symptomatic treatment or cast immobilisation for avulsion fractures of the base of the fifth metatarsal: a prospective, randomised, single-blinded non-inferiority controlled trial. Bone Joint J. 2016;98-B(6):806-811. PMID: 27235524 www.ncbi.nlm.nih.gov/pubmed/27235524. Asplund C, Best TM. Achilles tendon disorders. BMJ. 2013;346:f1262. PMID: 23482943 www.ncbi.nlm.nih.gov/pubmed/23482943. Campbell CM, Diamond E, Schmidt WK, et al. A randomized, double-blind, placebo-controlled trial of injected capsaicin for pain in Morton's neuroma. Pain. 2016;157(6):1297-1304. PMID: 26963851 www.ncbi.nlm.nih.gov/pubmed/26963851. Del Toro DR. Tibial neuropathy (tarsal tunnel syndrome). In: Frontera WR, Silver JK, Rizzo TD, eds. Essentials of Physical Medicine and Rehabilitation: Musculoskeletal Disorders, Pain, and Rehabilitation. 3rd ed. Philadelphia, PA: Elsevier Saunders; 2015:chap 94. Gollwitzer H, Saxena A, DiDomenico LA, et al. Clinically relevant effectiveness of focused extracorporeal shock wave therapy in the treatment of chronic plantar fasciitis: a randomized, controlled multicenter study. J Bone Joint Surg Am. 2015;97(9):701-708. PMID: 25948515 www.ncbi.nlm.nih.gov/pubmed/25948515. Grear BJ. Neurogenic disorders. In: Azar FM, Beaty JH, Canale ST, eds. Campbell's Operative Orthopaedics. 13th ed. Philadelphia, PA: Elsevier; 2017:chap 86. Jain K, Murphy PN, Clough TM. Platelet rich plasma versus corticosteroid injection for plantar fasciitis: a comparative study. Foot (Edinb). 2015;25(4):235-237. PMID: 26362235 www.ncbi.nlm.nih.gov/pubmed/26362235. Kadakia AR. Heel pain and plantar fasciitis. In: Miller MD, Thompson SR, eds. DeLee and Drez's Orthopaedic Sports Medicine. 4th ed. Philadelphia, PA: Elsevier Saunders; 2015:chap 119. Kigner S, Scardina RJ. Metatarsalgia. In: Frontera WR, Silver JK, Rizzo TD, eds. Essentials of Physical Medicine and Rehabilitation: Musculoskeletal Disorders, Pain, and Rehabilitation. 3rd ed. Philadelphia, PA: Elsevier Saunders; 2015:chap 90. Lareau CR, Sawyer GA, Wang JH, DiGiovanni CW. Plantar and medial heel pain: diagnosis and management. J Am Acade Orthop Surg. 2014;22(6):372-380. PMID: 24860133 www.ncbi.nlm.nih.gov/pubmed/24860133. LeCursi N. Sports shoes and orthoses. In: Miller MD, Thompson SR, eds. DeLee and Drez's Orthopaedic Sports Medicine. 4th ed. Philadelphia, PA: Elsevier Saunders; 2015:chap 115. Lee SM, Scardina RJ. Morton neuroma. In: Frontera WR, Silver JK, Rizzo TD, eds. Essentials of Physical Medicine and Rehabilitation: Musculoskeletal Disorders, Pain, and Rehabilitation. 3rd ed. Philadelphia, PA: Elsevier Saunders; 2015:chap 91. Mahindra P, Yamin M, Selhi HS, Singla S, Soni A. Chronic plantar fasciitis: effect of platelet-rich plasma, corticosteroid, and placebo. Orthopedics. 2016;39(2):e285-e289. PMID: 26913766 www.ncbi.nlm.nih.gov/pubmed/26913766. Montero DB. Hammer toe. In: Frontera WR, Silver JK, Rizzo TD, eds. Essentials of Physical Medicine and Rehabilitation: Musculoskeletal Disorders, Pain, and Rehabilitation. 3rd ed. Philadelphia, PA: Elsevier Saunders; 2015:chap 88. Murphy GA. Lesser toe abnormalities. In: Azar FM, Beaty JH, Canale ST, eds. Campbell's Operative Orthopaedics. 13th ed. Philadelphia, PA: Elsevier; 2017:chap 83. Nogueira MP, Farcetta F, Zuccon A. Cavus Foot. Foot Ankle Clin. 2015;20(4):645-656. PMID: 26589083 www.ncbi.nlm.nih.gov/pubmed/26589083. Orchard J. Plantar fasciitis. BMJ. 2012;345:e6603. PMID: 23054045 www.ncbi.nlm.nih.gov/pubmed/23054045. Park D, Singh D. The management of ingrowing toenails. BMJ. 2012;344:e2089. PMID: 22491483 www.ncbi.nlm.nih.gov/pubmed/22491483. Pasquina PF, Foster LS. Miller ME. Plantar fasciitis. In: Frontera WR, Silver JK, Rizzo TD, eds. Essentials of Physical Medicine and Rehabilitation: Musculoskeletal Disorders, Pain, and Rehabilitation. 3rd ed. Philadelphia, PA: Elsevier Saunders; 2015:chap 92. Price MD, Chiodo CP. Foot and ankle pain. In: Firestein GS, Budd RC, Gabriel SE, et al, eds. Kelley and Firestein's Textbook of Rheumatology. 10th ed. Philadelphia, PA: Elsevier; 2017:chap 49. Redmond AC. The ankle and foot. In: Hochberg MC, Silman AJ, Smolen JS, Weinblatt ME, Weisman MH, eds. Rheumatology. 6th ed. Philadelphia, PA: Elsevier Mosby; 2015:chap 78. Richter M, Kwon JY, DiGiovanni CW. Foot injuries. In: Browner BD, Jupiter JB, Krettek C, et al, eds. Skeletal Trauma: Basic Science, Management, and Reconstruction. 5th ed. Philadelphia, PA: Elsevier Saunders; 2015:chap 67. Stretanski MF. Achilles tendonopathy. In: Frontera WR, Silver JK, Rizzo TD, eds. Essentials of Physical Medicine and Rehabilitation: Musculoskeletal Disorders, Pain, and Rehabilitation. 3rd ed. Philadelphia, PA: Elsevier Saunders; 2015:chap 81. Wexler D, Grosser DM, Kile TA. Bunion and bunionette. In: Frontera WR, Silver JK, Rizzo TD, eds. Essentials of Physical Medicine and Rehabilitation: Musculoskeletal Disorders, Pain, and Rehabilitation. 3rd ed. Philadelphia, PA: Elsevier Saunders; 2015:chap 84. Wrobel JS, Fleischer AE, Crews RT, Jarrett B, Najafi B. A randomized controlled trial of custom foot orthoses for the treatment of plantar heel pain. J Am Podiatr Med Assoc. 2015;105(4):281-294. PMID: 25941995 www.ncbi.nlm.nih.gov/pubmed/25941995. York PJ, Wydra FB, Hunt KJ. Injuries to the great toe. Curr Rev Musculoskelet Med. 2017;10(1):104-112. PMID: 28124292 www.ncbi.nlm.nih.gov/pubmed/28124292. Reviewed By: Thomas N. Joseph, MD, Private Practice specializing in Orthopaedics, Subspecialty Foot and Ankle, Camden Bone and Joint, Camden, SC. Review provided by VeriMed Healthcare Network. Also reviewed by David Zieve, MD, MHA, Medical Director, Brenda Conaway, Editorial Director, and the A.D.A.M. Editorial team.